The last five days have led to a great deal of introspection across industries regarding relationships with, and even dependencies on, the greatest American ally of all: the immigrant. From its inception, FundersClub (FC) has understood and embraced the role of immigrants in our companies and our society. At an almost uncanny rate, immigrants supply the spark that powers the great American innovation machine. PayPal, Google, Tesla, and even FC all include co-founders that were born elsewhere. FC has strived to compile a portfolio that includes founders who hail from everywhere. The best founders, we’ve found, come from a diversity of backgrounds and places. We have a duty to our investor members, and to the fearless innovators of the world, to find, fund, and support the very best startups and startup founders without bias. Often, those startups were founded by either first generation immigrants or by the children of parents who immigrated to the United States with the idea that their children would have a chance to participate in a society and economic system that rewards risk-takers, innovators and hard workers. We wanted metrics on the impact that immigrants have had not only on the FC portfolio, but also on the U.S. economy. So we asked our portfolio founders to reply to a quick survey that revealed if they were first, second or third generation immigrants, where they were from, and how many jobs their companies have created. We received a robust reply, hearing from 82 founders in just 24 hours. Of those 82 founders, 39 are first generation immigrants, which means they were born somewhere else and immigrated to the United States. Clearly, this group was very motivated to reply, as they made up 48% of our respondents. 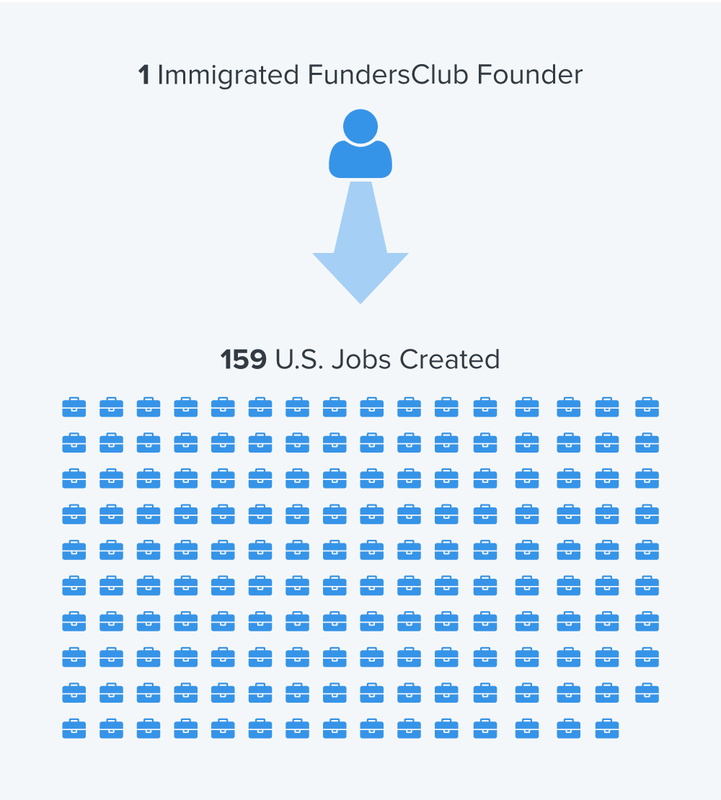 If we expand our dataset to also include data from second generation immigrant founders—21 additional founders—the numbers reflect an even larger impact. FC has a young portfolio. The very oldest companies in the portfolio are now ~4.5 years old. We expect the companies’ positive impact on the US economy will grow even more as time proceeds. There is strong precedent for this. A study by the National Foundation for American Policy found that 51% of startups valued at $1 billion or more had at least one immigrant founder. Valued together, those 44 companies are worth $168 billion. The United States has prospered for centuries on the strength of the people who have sought this place out, and arrived here, often arduously, via boat, flight and foot. Immigrants’ contributions to the tech ecosystem have helped the United States economy remain far more buoyant in recent years than those of other developed countries. This human capital edge has always been one of the main differences between the United States and the rest of the world. This snapshot of data is the result of a survey and is not intended to be a complete analysis of FC’s immigrant founder statistics or their impact on US job creation or the US economy. But it is valuable data that helps illustrate the indelible relationship between America's tech dominance, its doggedly upward job growth and, we hope, its unthreatened status as the land of opportunity and innovation. Note: On Feb 2 we corrected the number of countries for first generation immigrant founders to 18 from 19 and we corrected the number of countries for first and second generation immigrant founders to 25 from 26 due to a data error. Additional work on this piece by Siri Srinivas, Katie Kalmikoff, Jerrod Engelberg, and Eli McNutt.